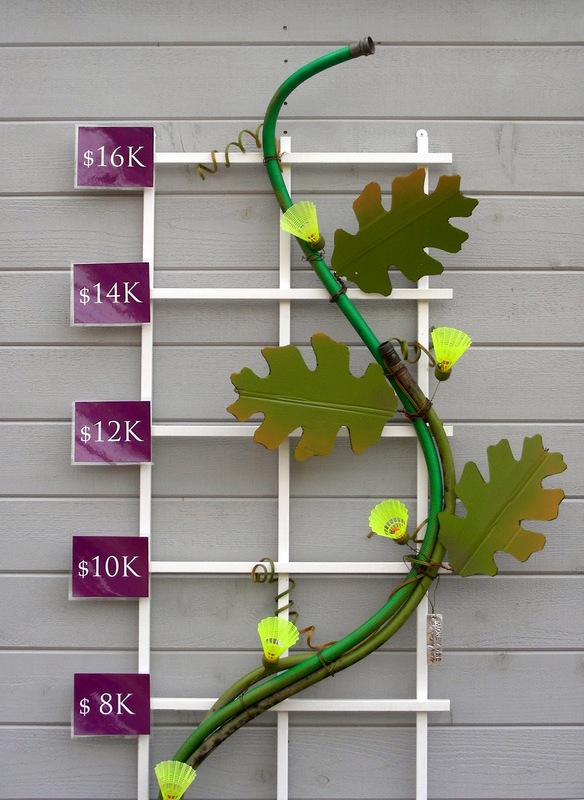 Check out the sudden growth spurt on Ned Wolf Park's Trellis-O-Meter! Thanks to a $10,000 grant from the Fairmount Park Conservancy, it looks like Phase II of the Terrace Wall Project will be completed very soon indeed. Kudos to the Friends of Ned Wolf Park for their persistent efforts to move this project forward for the community. New stonework will soon replace the low retaining walls made of landscape ties which you now see in the park. After 40 years of service, it's time for that failing creosoted wood to be removed in favor of a far more permanent solution: local schist and bluestone. But, we still need support from neighbors and local businesses to reach the $17K total that's required to create the seating surround that will create new opportunities for the park to host a variety of activities. You can help! "BUY A BRICK" with a $100. donation in order to reach our goal. For more details scroll down to read the November 2013 post or click the Older Postt link at the bottom of this page . [You can even click the Donate button on the right-hand margin of this blog to pay for your personally inscribed brick with a credit card!] Brochures/order forms are also available in the park's two information boxes. Now that the snow cover has melted, flowers are slowly appearing in Ned Wolf Park's gardens. Below, you can see some yellow buds of Winter Aconite about to open. They don't last long so look for them on your next visit. While there, you won't be able to miss all the white Snowdrops which are blooming in clumps drifting through the shady garden beds. They've multiplied and didn't let our frigid winter impede their elegant but cheerful presence as you stroll through Ned Wolf Park. Stay tuned, as we'll soon be installing the first batches of custom engraved bricks with the names and messages of the park's supporters!